, ritual act of driving out evil demons or spirits from places, persons, or things in which they are thought to dwell. It occurs both in primitive societies and in the religions of sophisticated cultures. The demon Eurynome, Prince of the Dead, from Collin De Plancy's Dictionnaire Infernal, 1863. Fortean Picture Library. And though this world, with devils filled, should threaten to undo us, We will not fear, for God hath willed His truth to triumph through us. The prince of darkness grim, we tremble not for him; His rage we can endure, for lo, his doom is sure: One little word shall fell him. Thus Martin Luther, in his famous hymn written in 1529, "A Mighty Fortress Is Our God," assured us we have nothing to fear from the devil as long as our hearts are in the right place. Devils are not confined to Christianity. Almost all religions have some kind of devils, demons, evil tricksters, and things that go bump in the night as a vital part of their theology. In Western cultures, the term "devil" calls to mind Lucifer, the "Morning Star," or Satan (literally the Satan, meaning "the accuser"). In Christian, late Jewish, and Islamic theology, the devil ("Iblis" to Muslims) is a created being gone wrong. Always masculine, and thus referred to as "he," the devil is not the opposite of God. He is not all-powerful, all-knowing, or able to be in all places at the same time. Instead he is a personal, malignant being, not so much full of hate as empty of love. His power is limited and lies mostly in temptation and in the ability to cause fear. Although he is not, in Genesis at least, associated by name with the serpent in the Garden of Eden, later Christian writers read back into the early Jewish story their developing conception, calling him, in the Book of Revelation, "that old serpent, the devil." In the book of Job he is the Satan, "the accuser of the brethren." Forced to report in with the rest of the angels after "roaming through the earth and going back and forth on it," he talks God into using the "upright and blameless" Job as a one-man testing ground wherein a cosmic battle of wills takes place between good and evil (Job 1:6-11). (It is interesting to note that the position of "accuser of the brethren" is still officially being filled on earth. When the Roman Catholic Congregation of Rites nominates someone for beatification or canonization, that person is represented before a papal court by a promotor fidei, or "promoter of the faith." To ensure proper procedure, however, they are opposed by an advocatus diaboli, a "devil's advocate" or "accuser of the brethren.") It is in the New Testament that Satan comes into his own. There he tempts Jesus three times, trying to lure him away from his appointed task (Matthew 4). He tries to get the apostle Peter to talk Jesus out of going to Jerusalem. "Get behind me, Satan!" Jesus yells to a very surprised disciple (Matthew 16:23). After all, Peter had just a moment before heard Jesus say, "Blessings on you." Peter must have learned his lesson because in his first letter he warns Christians to watch out because their "adversary the devil prowls about like a hungry lion, seeking someone to devour" (1 Peter 5:8). It was Satan who "entered into Judas" (Luke 22:3), prompting him to betray Jesus. He is all over the apostle Paul in the book of Acts. James assures Christians that if they "resist the devil he will flee" (James 4:7). And that's good news, because in Revelation things really heat up. The devil-inspired Antichrist takes over the world for a time. At the Second Coming, Satan is "chained" for a thousand years while Earth gets its breath back (Revelation 20:2). But he is released to try again (Revelation 20:7-10) before finally being thrown into "the lake of fire... there to be tormented for ever and ever." Who is this creature? Where did he come from and why does God allow all this carnage? You were the model of perfection, Full of wisdom and perfect in beauty. You were in Eden, the garden of God; Every precious stone adorned you... On the day you were created they were prepared. You were anointed as a guardian cherub, for so I ordained you. You were on the holy mount of God... You were blameless in your ways from the day you were created till wickedness was found in you... So I drove you in disgrace from the mount of God and I expelled you, O guardian cherub... Your heart became proud on account of your beauty... So I threw you to earth. But why does God allow Lucifer, now called Satan, to have such power? It's all part of the plan, according to the apostle Paul. The conservative explanation is this: God knew sin was bad because God knows everything. But the rest of the angels had never seen sin before. They didn't know why saying "I will" five times to God was such a bad thing. If Satan were simply destroyed, the angels would spend eternity in fear, hoping they didn't get "zapped" like Satan and his followers, the fallen angels now called demons. And God wants love in heaven, not fear. So how does God show the angels how bad sin is without endangering heavenly harmony? A planet is cleared off and prepared as a sin laboratory. Humans are created. Satan is confined to work his wiles for a few thousand years—just long enough to make a real impression. Yes, humans fall. But God shows he is big enough to take the penalty himself. Jesus dies for humans and takes their punishment. After about six thousand years, it's all over. Satan gets the punishment he richly deserves, and the angels, called principalities and powers, come to understand. Satan and his demons fell victim to temptation, but the lesson is eternally imprinted upon the minds of those who keep the faith. It's a little unclear exactly when Satan and his demonic host were cast out of heaven. Some say it happened before the creation of humans, right in the middle of the first verse of the Bible (see Creationism). But Jesus claims to have seen it happen after the disciples were sent out on their first evangelistic mission in Luke 10:18. Finally, in Revelation 12:9, we are told that "the great dragon was hurled down, that ancient serpent called the devil or Satan, who leads the whole world astray. He was hurled to the earth and his angels with him." This event doesn't happen until near the end of human history. It is often argued that these are three views of the same event, seen from three different perspectives in time. Although I am less than the least of all the apostles, this grace was given me: to preach to the Gentiles the unsearchable riches of Christ, and to make plain to everyone the administration of this mystery, which for ages past was kept hidden in God, who created all things. His intent was that now, through the church, the manifold wisdom of God should be made known to the principalities and powers in the heavenly realms, according to his eternal purpose which he accomplished in Christ Jesus our Lord. Humans are rewarded, of course. After all, they were the innocent victims of the whole thing. In the end, angels are made to serve them. Angels, after all, are created beings. But humans, though also created beings, are adopted into God's own family as part of the plan that eventually destroys Satan. 1. Do all Christians accept this version of the story? Of course not. Christians don't all agree about anything. 2. Do any other religions have a similar story? Yes, Muslims have the same story. At least it starts out the same way. But they give it a different twist. In their version, Iblis, the Satan figure, loves God too much. When the angels are told to bow down to humans, Satan refuses. It's not because of pride, as in the Christian version. It's just that he loves God too much to bow down to anyone else. So Iblis is cast out of the presence of his Beloved. And how does he console himself for all eternity? By remembering the sound of his Beloved's voice and the last words his Beloved said to him. And what were those words? In effect, "Go to hell!" 3. If Satan is a personal being, a fallen angel, why doesn't he look like an angel? Throughout the years the image of Satan has changed with the times. Somewhere along the line, probably as a result of Christians associating him with pagan images, he developed horns, a forked tail, and a pitchfork. Lately he is seen in movies as a briefcase-toting lawyer type who has contracts for your soul available at a moment's notice. Often he takes great delight in torturing the damned in the fires of hell. But none of this is found in the Bible. Hell is his final punishment, not his domain. The deep-seated fears resulting from thousands of lurid stories have caused untold psychological damage to people raised on vivid tales of a loving God who sends people into eternal torment. And, the power of mythology being what it is, it is difficult to simply decide not to believe in, and thus not to fear, such a monster God. Satan (in Islam, Iblis), in the teachings of certain religions (Christianity, Islam, and others) an evil spirit or the chief of the evil spirits, the “unclean force” opposed to god and inciting man to sin, the ruler of hell, the personification of evil. (Russian, chert, bes), in religious and superstitious representations, an evil spirit, unclean force, or supernatural being. 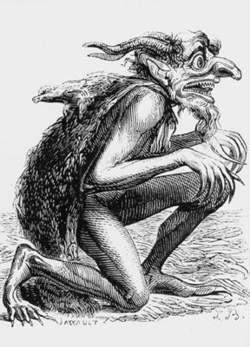 Devils are described in folklore and in works by A. S. Pushkin, N. V. Gogol, F. M. Dostoevsky, and other writers. A wooden hand float with nails projecting from each corner; used to roughen the surface of plaster to provide a key for the next coat. Dreaming about devils and demons is usually very frightening and you may awake from fear. The devil does not generally represent something outside of you. It usually symbolizes the most negative and least developed part of you. It may be that part of you that is ignorant and destructive. You can determine the meaning and message in your dream by looking at all of the details carefully. All dreams are good dreams in that they bring unconscious materials to the conscious mind. Only then can you begin to effectively cope with the more unpleasant sides of your personality. Carl Jung called this negative side the “shadow.” The devils in your dreams could be representations of your personal shadow or they could be a glance at the collective shadow. Yet it is clear, as this panoramic and deeply researched social history unfolds, that the author of Between the Devil and the Deep Blue Sea looms large, like St. The skeptics may have their doubts, but when a boat sinks at the drop of a dime, the truth may lie somewhere between the devil and the deep blue sea. Between the Devil and the Deep Blue Sea is a stunning debut with complex characters, an atmospheric setting, and a distinct voice.